"If you are not serious about achieving kosen-rufu, just quit and get out! We don't need any cowards here. Tomorrow, just attach a flyer describing the benefits of the Gohonzon to a hundred dogs, and let them loose in Tokyo! I'll take care of the rest of kosen-rufu myself!" 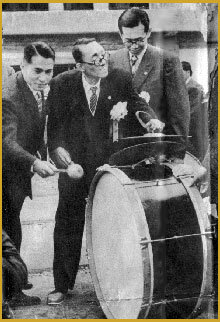 ––Josei Toda, quoted in the World Tribune, May 15, 1998, p. 9.
tests one of the Brass Band's drums. 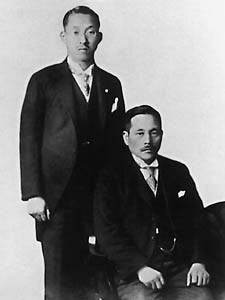 Third President Ikeda is at left. "Nothing is more barbarous than war. Nothing is more cruel. And yet, the war dragged on. Nothing is more pitiful than a nation being swept along by fools." 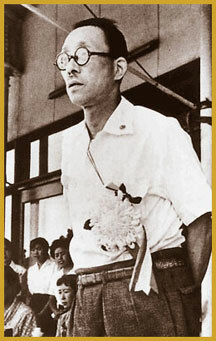 Daisaku Ikeda's novellized version of the early days of the Soka Gakkai.